About three years ago I felt like a beginner again. After spending most of 2013 researching and writing about ARCHICAD (and moving around the country and taking care of my family), I finally started doing a live project. 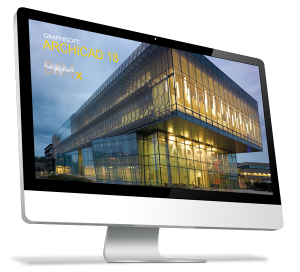 When one uses ARCHICAD to research, test, and record videos, it is a bit different from working on a live project. Some shortcuts aren’t touched. Certain tools and options aren’t used that often. And in general the flow of the work is drastically different. I found myself in a weird situation. My conscious brain had forgotten so much—what many of my shortcuts were, where a few menu items resided. I could find everything by exploring but my active knowledge had atrophied. What was curious was that my unconscious brain remembered everything. I could work and, if I didn’t think about it, my hands went to the right shortcuts; without trying I clicked on the right menu items. But once I thought “how did I do that; I need to do that again” I was lost. I couldn’t tell you what my key command for split was at the moment, but if I just thought “I need to split this” or—not even that—if I just looked at an element and knew I needed to split it, I’d go to the right keyboard keys. The less I thought, the better I did. About a year ago I faced a similar situation when I redid all my keyboard shortcuts for ARCHICAD 19. At first it was like working while drunk. My hands would go to the wrong keyboard keys. I was forced to go slowly. I consciously made myself use my new shortcuts. In both 2013 and 2015, I had to relearn. These experiences made it easier for me when in 2016 I again tweaked my keyboard shortcuts for ARCHICAD 20. Having re-educated myself twice, I had a plan. I knew that muscle memory could be retrained and that I could break old habits. And more importantly, as discussed in my previous post, I was more aware of learning my keyboard shortcuts (and other changes). I focused on both muscle memory and context. Now if I can’t remember my exact keyboard shortcut for Morph, I can either clear my mind and let my hands go to the right location, or I can remember how that keyboard shortcut relates to other shortcuts and deduce what it must be. Furthermore, my Toolbox dropdown menu shows the keyboard shortcuts, so I am constantly reminding myself of what the shortcuts are when I am not using them. Context, muscle memory, visual cues, and continued awareness help me make my current keyboard shortcuts more resilient, even if I don’t use them for a while. These experiences also taught me to stop making keyboard shortcuts for everything. There are now a number of keyboard shortcuts I no longer use or create, instead relying on the Context Menu or on-screen buttons. I found that while it’s wonderful in theory to have a keyboard shortcut for everything, there are a number of functions in ARCHICAD I just don’t use enough to maintain that knowledge—conscious or otherwise. So for instance I once had keyboard shortcuts for Line and Fill Consolidation. Now I just use buttons. I don’t need my forgetfulness to slow me down, or cause roadblocks. Retraining myself all these times reminds me of how experienced users have huge amounts of tacit knowledge. We know all this stuff about using ARCHICAD which we can’t explain because we know it all unconsciously. We have gained knowledge but not necessarily the wisdom to describe how we accomplish a task. As a result simple steps disappear when we teach new users. And when something goes wrong we don’t always understand why. We don’t realize that for some reason today we are skipping something we have done a million times. For experienced users, we can usually problem solve our way out of these issues. We have our experiences to rely on when figuring out why today what always worked doesn’t (though sometimes that wastes a lot of our precious time). New users aren’t so lucky. They lack the references and clues we have. Fortunately an experienced mentor can help bridge this gap. It’s amazing how often number one fixes things. And it’s just as amazing how often number two results in nothing wrong happening. It sounds crazy, but it’s not. One of my favorite topics resides somewhere at the intersection between the rise of the digital natives and why architects think the pencil is special. Clicking ability fits into this perfectly. If you pick up a new writing implement, whether a 6H pencil or a calligraphy brush, your years of experience with the mighty 2B pencil or crayons apply. You can quickly (and unconsciously) test how the tool reacts to the paper. You notice that the lead is harder or the brush more gentle, but you can more or less ignore the tool and get to sketching. You might not be taking full advantage of what makes the 6H or brush special, but you can dream near full speed. Computer software has a non-haptic feedback loop, and a unique language that differs from program to program. There is nothing tactile that alerts how sensitive elements are—that an element’s corner is different from an edge which is different from the midpoint which is different from a face, that each might vary depending on the view, and that all those spots act differently on a Wall, Roof, Morph, etc. Or that holding down a key or clicking too short or too long will change everything again. Instead we have to learn the visual feedback language of ARCHICAD to make it a fluid tool for architecture. When thinking about clicking, there are two primary things to be aware of: what the cursor looks like and what Pet Palette appears after the click. The Intelligent Cursor in ARCHICAD changes shape depending on where over an element your cursor is. And depending on where your cursor is over an element affects what Pet Palette appears when you click, how dimensions find (or don’t find) elements, and much more. 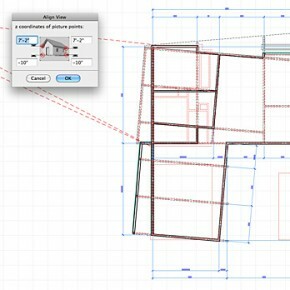 The link at the start of this paragraph will take you to the ARCHICAD Helpcenter article on cursor shapes. Read it. It becomes repetitive, but in a good way. The repetition reinforces the similarities between the different cursors. For instance, regardless of the cursor shape, a heavy/filled cursor refers to the same thing. No one needs to memorize what each cursor represents, but having familiarity with the categories will help you sense when things are right or wrong. Being able to look at the cursor and think “that doesn’t feel right” or “that looks correct” will help avoid clicking errors—as the different cursors are clues to what ARCHICAD thinks you’re trying to do. The ever changing cursor is the ARCHICAD analog for how the pencil feels in your hand. 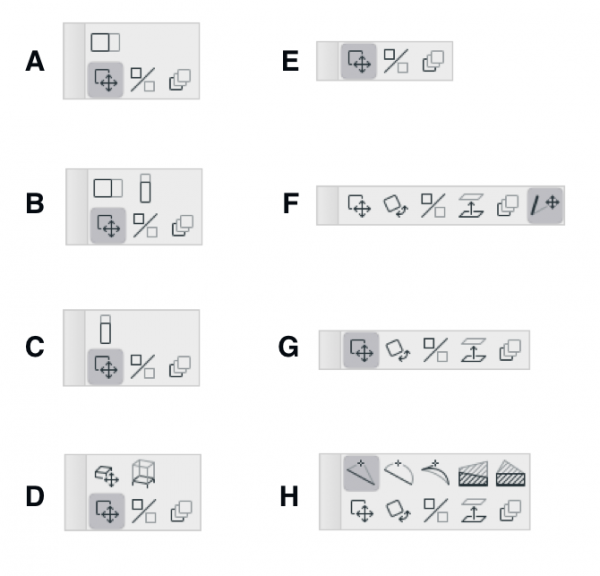 The variety of cursor shapes highlights how many different ways there are for a user to interact with elements in ARCHICAD. As the cursor moves across the screen, it is constantly detecting different aspects of elements (and empty space) below. As a quick example of how much the cursor changes, the video below is fifteen mesmerizing seconds of the cursor moving around a small portion of one element. Can you tell when the Intelligent Cursor goes over the Wall’s Reference Line? It happens twice. As I mentioned above, what Pet Palette you’ll get depends on where you click on an element (both where on the element and in what view). Your initial instinct might be to find this annoying; why can’t we have all options available everywhere? Look at the small sampling of Pet Palettes below. There are fifteen different buttons. Imagine if every time you clicked on this particular element, all those options (plus the ones not shown) appeared. That’d be annoying. Especially when all you really wanted was one of the three buttons in Option E. By intuiting the relationship between cursor shape, element type, and Pet Palette, you can get only the options you need by instinctively clicking in the right spots. Getting the right Pet Palette is something that is easy for experienced users and frustrating for new users. Think about it this way, you probably know how to get all the Pet Palette options listed below while you’re working. You know where to click when you need to get options B, F, or H. But if you had to say the answer, could you? Could you tell me what Viewpoint each Pet Palette was created in? Would it help if I told you A-E were from one type of Viewpoint and F-H were from another? Could you tell me what element type I’m clicking on? Or what other elements would give me the same Pet Palettes? And hardest of all, could you tell me where I clicked on the element to get each Pet Palette? I’ll put the answers at the end of the article. Click on a Wall to get Pet Palette B in the list above. For an extra challenge, get Pet Palette D.
Select five windows, four walls, three doors, two slabs, and one roof in 3D. Now do the same in 2D. If you are working with a Morph and your Pet Palette doesn’t give you the options you want, what do you do? (hint). Make the cursor turn into a filled pencil. Make the cursor turn into a part full eyedropper (not full or half full). Wall bottom corner in elevation. Wall top corner in elevation. Wall corner with reference line perpendicular to View. 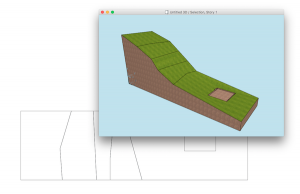 Wall corner in elevation with Groups Enabled (and element part of a group). Wall end point in plan. Wall reference line in plan. When selecting elements, if you don’t have a reason to do otherwise, click on a corner. It’s easy and reliable. If a user can’t select anything in the Layout Book, what should they do first? Check to see if Snap to Grid or Snap to Construction Grid is turned on. That’ll screw up clicking BIG time—especially if the grid is big (think feet) because there might only be a few snap points, if any, in the sheet (imagine a four-foot snap grid and trying to work on an 8 1/2 x 11″ layout). I thank you for this didactic presentation. Iam a teach yourself beginner and found you tips very helpful.